COLUMBUS, Ohio -- The top players of the Pacific Coast League and International League produced a bunch of offensive fireworks in the Triple-A All-Star Game on Wednesday at Huntington Park. The two teams piled up a bunch of records and near-records in the game, finishing with 19 runs on 29 hits in a contest the PCL won 12-7, the league's consecutive victory in the midsummer classic. 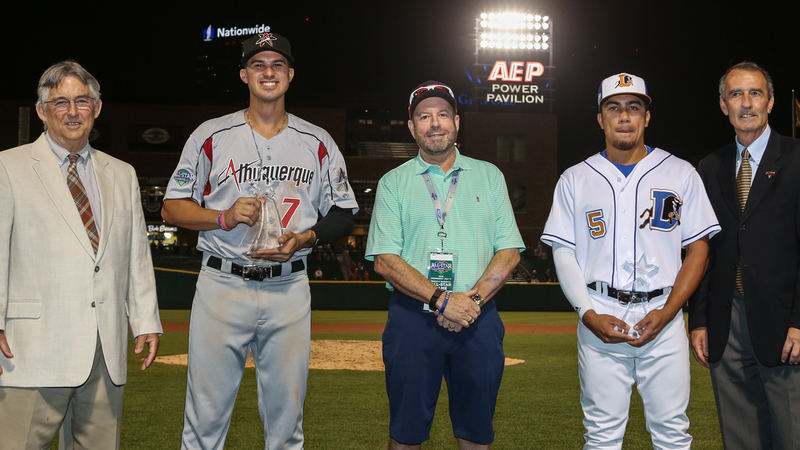 "In Albuquerque, every game is 20 hits and 10 runs, so this was nothing different," said Isotopes third baseman Josh Fuentes, who was named BUSH'S® All-Star MVP for the PCL after delivering a homer and an RBI single. "I think this is a special group of hitters, and I thought we proved that by getting a lot of hits and a lot of runs." The game was played before a crowd of 10,516 -- the largest crowd for a Triple-A All-Star Game since Buffalo hosted 18,025 fans in 2012. And that loud crowd was treated to one of the largest offensive outbursts in the history of the game, which was first played in 1988. The 12 PCL runs for marked the third-most for one team and the most since the IL posted 13 in a 2003 in Memphis. And the 19 runs for both teams were the most scored in the contest since the IL won the 2003 game, 13-9. The two teams combined for 29 hits -- 15 for the IL and 14 for the PCL -- the largest total in the history of the contest. "I thought the pitchers were great, but the batters were really locked in," said Durham's Kean Wong, who was named the BUSH'S® All-Star MVP for the IL. "Hitting is contagious: One guys starts us off, and another guy wants to follow that up. It was a hitting game, and it was a lot of fun." The IL started the scoring in the first inning off PCL starter Dakota Hudson of Memphis when Francisco Mejia of Columbus singled, moved to second on a single by Lehigh Valley's Joey Meneses and came home on a single by Norfolk's D.J. Stewart. Then the fireworks began in the top of the second when the PCL erupted for six runs off two pitchers -- Tyler Eppler of Indianapolis and Adam Wilk of Columbus. Fuentes got things rolling with a long home run to right and was the first of six straight batters to reach base for the PCL. "You just want to be on time and find something you can hit," Fuentes said of his hitting strategy. "The count was 2-0, and I put a good swing on an outside fastball. When I saw the ball carry, I thought it was gone. It's very special." Eric Campbell (New Orleans) followed with a walk and Frank Schwindel (Omaha) singled before a double by Zach Borenstein (Las Vegas) plated Campbell. Luis Urias (El Paso) lined an RBI single to left and Borenstein crossed the plate on a groundout to the mound by Mike Tauchman (Albuquerque). After Socrates Brito (Reno) popped out and AJ Reed (Fresno) walked, Wilk came in and gave up a run-scoring knock to Christian Bethancourt (Colorado Springs) and Fuentes' single. That outburst tied the record for most runs in one inning previously set by the PCL in the ninth inning of the 2008 game. The PCL added two runs in the third off Wilk, who threw wildly to first on a pickoff attempt to score Schwindel, then surrendered an RBI single to Tauchman. The IL surged back into the contest with three runs in both the fourth and the fifth. The fourth-inning rally came off Brett Kennedy (El Paso) and was fueled by a two-run homer by Eric Haase (Columbus) before Wong doubled and was singled in by Kevin Newman (Indianapolis). In the fifth, Buffalo's Jason Leblebijian plated a run with a single, and Wong lined a two-out, two-RBI double into the right-field corner before he was thrown out at third. "I saw that our baserunner was rounding third as the relay man got the ball," Wong said. "I wanted to force the relay man to throw to third to get me [out] to allow the runner to score." The PCL got two of the runs back off Louisville's Kevin Quackenbush in the sixth thanks to the speed of Round Rock's Scott Heineman, who walked, then stole second and third before Dylan Moore of Colorado Springs walked. Then Heineman and Moore combined for a double steal that scored Heineman and Moore came home on a single by Oklahoma City's Rocky Gale. Then the PCL tacked on two insurance runs in the ninth off Ian Gibaut of Durham, with the big blow coming on an RBI double by Reno's Ildemaro Vargas. Wong went 3-for-4 with two RBIs and one run scored while Stewart was 3-for-3 with three singles, two runs and one RBI. Wong tied the record for doubles by one player in the game, and Stewart matched the game record for singles by one player. Heineman finished with four stolen bases to double the previous game record of two. The PCL finished with seven stolen bases, more than doubling the game record of three. John Wagner is a contributor to MiLB.com. This story was not subject to the approval of the National Association of Professional Baseball Leagues or its clubs.